King Henry faces rebellion from the very nobles who helped him seize the crown. Neither side bears scrutiny, but the insurgents boast the dazzling Hotspur while the sovereign’s son and heir gets smashed in the taverns of Eastcheap. If manhood, good manhood, be not forgot upon the face of the earth, then I am a shotten herring. There lives not three good men unhanged in England, and one of them is fat, and grows old. At the Battle of Shrewsbury, Sir John Falstaff feigns valour, anticipates reward, and dreams gladly of merry England after Henry’s death, when Prince Hal will be King. Chief Justice: Well, God send the Prince a better companion! Meanwhile Falstaff returns to London, impatient to greet his old drinking companion, the new King of England. Buy Henry 1V items such as the theatre programme and Rogues Company from the NT bookshop. ". . . Henry's own son, Matthew Macfadyen's Prince Hal, is damaging the royal family's image by boozing with Michael Gambon's terrifically dishevelled Falstaff. . .
On the downside, the theme of youth versus age is somewhat undermined because Macfadyen and Harewood look a tad too old to be behaving like teenage-style rebels. However, getting longer in the tooth while their elders cling on may well be exacerbating their behaviour. . . Though Macfadyen can seem stolid, he also persuasively portrays Hal as a public-school brat going to seed, dimly aware he could turn into another Falstaff as he swigs his wine. His flashes of latent regal dignity never struck me as fully convincing, but he's an intriguing mix of arrogance and insecurity. The way he nods repeatedly during his first soliloquy about reforming also interestingly suggests a lost soul trying to rhetorically persuade himself - as well as us - that he can only get better. Hytner leaves a large moral question mark hanging over his final transformation into Henry V, who instantly declares another war. . .
Bradley's crescendo of parental rage is brilliantly developed as this frosty patriarch gradually reveals a wellspring of wounded tenderness. MacFadyen's surly silence is also hiding bruised filial love. Their deathbed reconciliation scene is particularly moving. . .
At the end, when Macfadyen's Hal finally shakes him off, Gambon seems to tragicomically deflate to the size of an abandoned baby, curling into helpless decrepitude as the new king's procession moves on." ". 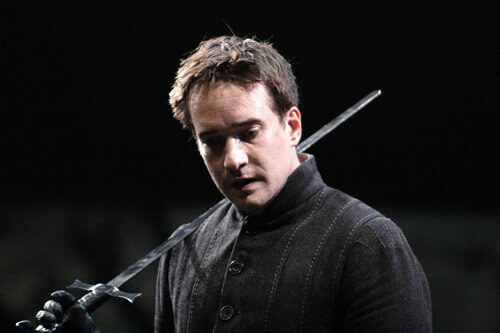 . . Matthew Macfadyen memorably captures the unlovable calculation of Prince Hal, but he is moving, too, in his pained encounters with his father. . . "
". . . the thinking virile charm of Matthew Macfadyen's Prince Hal, both calculating and naive, would be ideal if only he let the words dance. . . "
"AFTER weeks of being bombarded by enervating arguments about our sceptred isle's future, it should have been a relief to see the two Shakespeare plays that deal most lucidly with that subject. And, yes, Michael Gambon, Matthew Macfadyen and David Bradley were better company than the party leaders on the telly. But I must admit that they didn't always light my mental and emotional fires. Which father or father figure will end up controlling that impressionable leader-in-waiting, Macfadyen's Hal? Bradley's king, who matches Stafford Cripps for austerity, or Gambon's Falstaff, who is more like Fungus the Bogeyman? Britain's national health, by which I don't just mean the state of our hospitals, depends on his choice. Indeed, the nation's soul is at stake. Nicholas Hytner's revival doesn't quite leave us feeling that. For the two Henries to work, we must feel that Falstaff is a temptation, a lure, a danger. But from the moment he waddles painfully on stage, an askew belt on the grubby vest that precariously packages his vast belly, Gambon isn't even a refreshing change from Henry's wintry court. He lacks charm, fun and, surprisingly, charisma. All Hal is doing is slumming with a rheumy oldster who might be the ancestor of one of Gambon's recent successes, the cadging tramp in Pinter's Caretaker, or Humpty Dumpty years after he's fallen off his wall. I'm all for desentimentalising someone who can become Santa Claus minus the reindeer, but Gambon goes too far, sacrifices too much. The odd moment of youthful reawakening - antique kung-fu kicks as he prepares for the robbery at Gadshill, a gormless twirl over the stage when he's asked to fight the rebels - fails to correct the overall impression. This Falstaff is morally so ill that he robs corpses on the battlefield and physically so sickly his decline in Part Two scarcely registers. Gambon's slovenliness extends to his diction, which is often bleary and blurry. And that complaint must also be directed at Macfadyen, though his tendency is to scramble his words and jab at his syllables. As for his Hal, he's a cool young man who neither enjoys his japes very much nor seems to be using Eastcheap as a human lab that, as he says in a speech that should be twice as chilling, is meant to serve his own career. Indeed, he's pretty bored with the place well before a rejection scene that leaves Gambon's Falstaff doubled up with shock but Hal finds far too easy. . . ."
". . . But there is also human pathos. Matthew Macfadyen's witty, shrewd Prince of Wales is far more at ease than is usually the case with his game-plan of slumming it in order to win eventual credit for reform. That makes him emotionally less accessible to this Falstaff, who seems to spend the plays vainly reaching out to him for a gesture of affection that never quite comes. . . "
". . . in Hytner's hands they become a study of a son desperate to engage his father's love. And Matthew Macfadyen plays Hal very intelligently, as a brooding solitary who hangs out in taverns as a way of gaining his father's attention. And when the death-bed reconciliation between father and son finally comes it is deeply moving; although even here you notice how the expiring king passes on Machiavellian counsel about the need "to busy giddy minds with foreign quarrels". I feel we've heard that somewhere before. But the very intensity of the father-son relationship means that Falstaff is slightly marginalised; and, if anything is clear from Hytner's production, it is that the love between Falstaff and Hal is all one way. Gambon's fat knight, in velvet toque and trousers, is clearly a Hal groupie who in the mock father-son scene in Eastcheap raises a genuinely imploring hand on "Banish not him thy Harry's company". And even after Hal has warned Falstaff of his eventual expulsion, Gambon follows him around the tavern with the watery eyes of a desperate spaniel. . . "
". 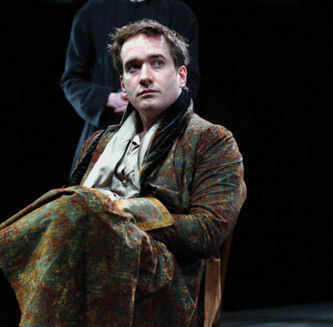 . . Matthew Macfadyen (Prince of Wales) is fresh, confident and energetic as the Prince of Wales. . . ."